The Chilliwack/Vedder River is the same river, the name for some reason unknown, changes at the town of Vedder crossing. Above the crossing the river is referred to as the Chilliwack, and below, as the Vedder. Most refer to the river as simply the Vedder. The Vedder River system runs through two small towns; Vedder Crossing in mid river, and the town of Yarrow at the bottom end. The Vedder River gets its water supply from Chilliwack Lake, as well as various streams accumulating runoff and rain water from the surrounding mountains. The top end of the Vedder is characterized by endless pocket water, and deep boulder strewn runs. The water is fast in spots, and usually runs clear. The river is plagued by a clay bank, approximately 4 miles below the fishing boundary, that leaves the bottom end of the river running dirty, even after a small rain. Runs such as Allison Pool, Boulder Run and the Tamahi Creek area attract large numbers of anglers in both Coho and Steelhead season. The river widens and slows as it approaches the Vedder canal, where it eventually flows into the Fraser River. Popular spots in the bottom end are Lickman Road, The Campground, and the Train Bridge. The Vedder receives an incredible amount of fishing pressure, largely due to the high returning numbers of Springs, Coho’s, and Steelhead. The River, though, is long, with 50 Km. of fishable water. For some odd reason, most anglers congregate in a small portion of the river, leaving plenty of room for those that don’t mind hiking and exploring. 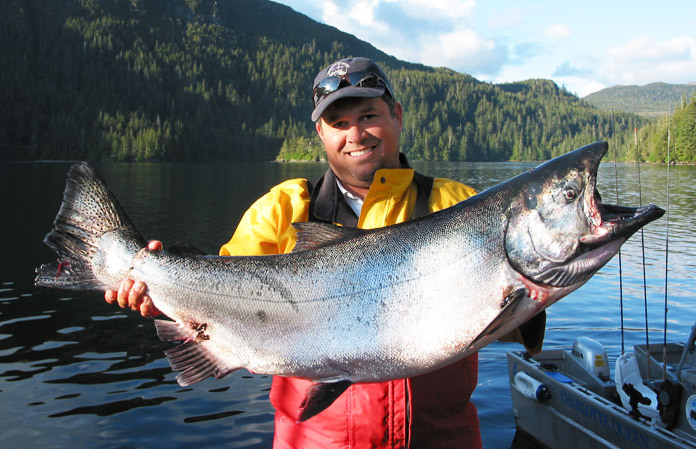 The Vedder is the top producer of Coho in the Fraser Valley, and for this reason receives a lot of angling pressure. The fish first enter the river in early September, and can be caught bullet chrome until late November. The bulk of the run enters the river in late September and fishing is hot until the White Springs show up in early October. Early in the season fresh roe is the ticket to success. Anglers will also do well on wool ties and corkies, as well as spinner blades and spoons in the slack water. Later in the season the Springs show up and push the Coho out of the obvious water into the pocket water and fast water. In years of little rain, the fish are skittish, and small roe bags and wool ties are the key. 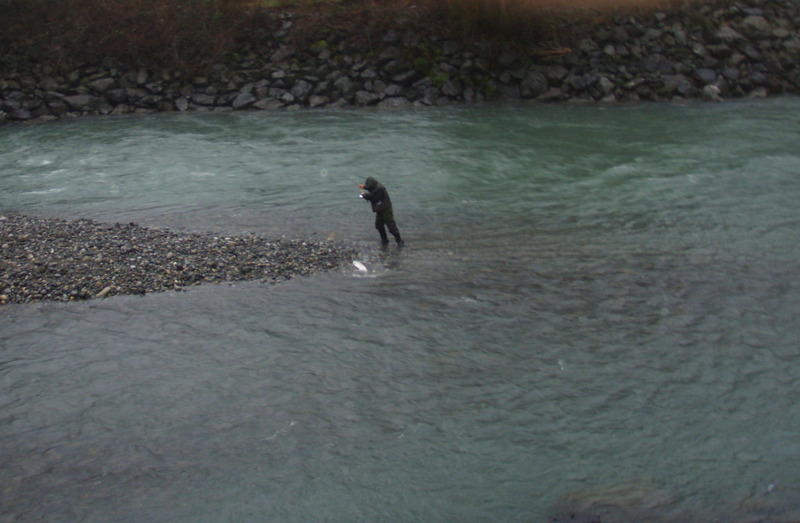 The Vedder receives two distinct runs of Spring Salmon every year. The first run consists of red fleshed Springs that enter the river at the beginning of July. Depending on the year, opening day can be productive, or a total bomb. The numbers of returning Summer fish are small, around 5,000, and pressure at this time of year is relatively light. These fish can be seen rolling, and anglers walking the dykes below Vedder crossing may find fish that way. These Red Springs are smaller than their fall brothers, but definitely more desirable, due to their red flesh. The second wave of Chinooks are white fleshed (Harrison River Brood), and enter the river in early October and run through November. These fish are big and plentiful, and are known to shatter rods. Bring a strong enough rod (leave the noodle at home), as these fish average 20+pounds and pull like a train. Wool ties in red/white, red/peach, as well as big corkies and spin and glows fished below a float (see techniques) are popular. Roe is effective, but unnecessary as these fish are aggressive. The Whites favor deep fast runs and pools and will occupy all attractive looking water that offers them depth and cover. The Vedder is by far the most productive Steelhead stream of the Lower Mainland/Fraser Valley Rivers. As with all Vedder stock, it is heavily supported by hatchery fish. 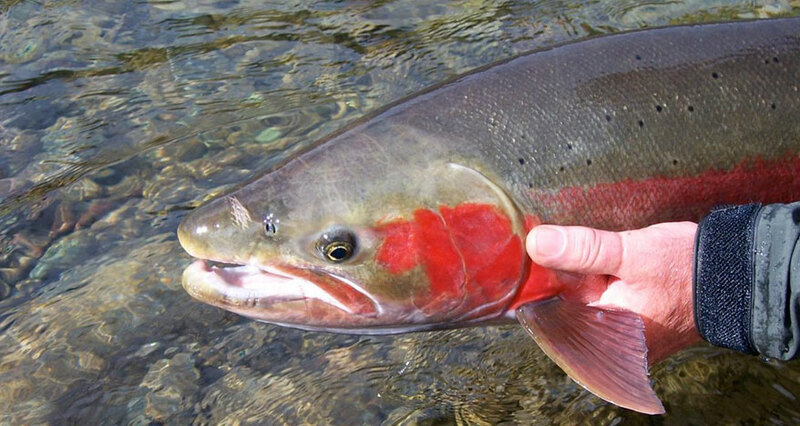 The first Steelhead enter the river in late November, with steady bumps of fish through April. The river produces both hatchery and wild winter run steelhead. With the exception of the odd straggler, there is no run of summer steelhead to speak of. The river fishes consistently for the most part of steelhead season. The river often has some color to it, especially in the mid to lower river sections, below the landslide. Fishing for steelhead can be productive at any given time in the months of January right through April, with few early fish showing up in November and December. Following a rain, resulting in rising water levels, new fish do tend to push into the river. Some of the more popular and effective steelhead catching techniques on this river are: wool ties, pink worms, spoons, spinners, and quality salmon or steelhead roe. Some of the more effective wool colors include pink, peach and orange. Since this is a river of fair size, and the average fish size is around the 12+lb. range, consider the use of heavier gear. There are fish in the 20-lb. range are caught each year. Most of the river is easily accessible by paved or gravel roads due to urban development. For this very reason, it is still possible to find your own water. However, if you are looking for the company of other anglers you will want to fish some of the more popular spots such as the Limit Hole, Allison’s pool, Tamahi, Crossing Bridge, Peach Road or Lickman Road. The upper and middle sections of this river are much faster and rockier than the bottom section with a lot of pocket water. The lower end of the river has more slower, pooling water. Finally there is a canal that meanders towards the Fraser River. The Vedder can offer some excellent fishing at all times of the year, so get out there and hike this lovely, albeit crowded, river.